New AMD Zen Processors to Make BOINC Computing & Gridcoin Mining More Competitive? AMD recently unveiled some key specs about its new “Zen” processor architecture at the Hot Chips 28 convention. The new Zen “Summit Ridge” desktop processor will feature 8 cores and 16 simultaneous threads, while the “Naples” enterprise server version will sport an impressive 32 cores, with a total of 64 threads of processing power. 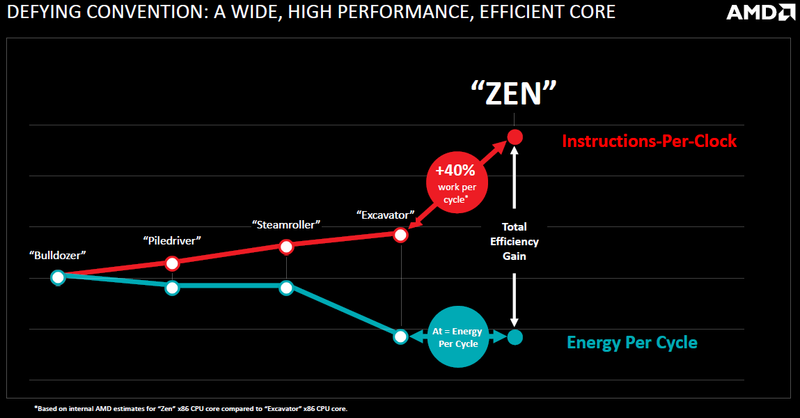 The new Zen chips will be about 40% more efficient than previous generations, so 40% more instructions per clock cycle. A massive improvement compared to the FX line of processors. AMD’s current generation of processors have cores that are more akin to modules with a shared floating point core, but the Zen chips have standalone cores, much like Intel’s designs. AMD has stated that the Summit Ridge line will be available to consumers in the first quarter of 2017, with the behemoth 32-core Naples coming out by the middle of 2017. Electricity costs are a huge factor in the field of Boinc distributed computing, especially in European countries which some of the highest power costs in the entire world. Zen’s 40% efficiency boost over previous generations of processors will sound very appealing to the Boinc cruncher paying $100-200 in electricity costs on a monthly basis. CPU-only Boinc distributed computing projects like Universe@home, LHC@home and Rosetta@home will likely become more competitive as enthusiasts begin to upgrade their hardware. While AMD has not officially released any TDP specifications for the Zen line, or any estimates on retail pricing, it’s very unlikely that the Summit Ridge chips will have a significantly higher power draw than, say, FX-8350 Vishera-based chips. In fact, Digital Trends reports that AMD is aiming for a TDP of 95-100 watts for Zen. Given the whopping 40% hike in performance, many Boinc participants – even diehard Intel fans such as myself – may be tempted to upgrade their power-thirsty, aging rigs with AMD’s new workhorses. The temptation will be even higher for the thousands of miners on Gridcoin, a blockchain-based digital currency where miners mint coins by computing Boinc scientific work units. The Gridcoin network spits out 48,000 coins/day – about $250 at current exchange rates – with the largest slice of the daily pie going to the miners with the biggest Boinc contributions. One Response to New AMD Zen Processors to Make BOINC Computing & Gridcoin Mining More Competitive?